Preparing a home for a new baby is an exciting and joyful time but it can also seem a little daunting. There are lots of decisions to be made and sometimes the “to do” list can seem overly long. A top priority for all expecting parents is to decide where their newborn is going to sleep. Many parents-to-be like the idea of a bassinet, which provides a warm and cosy sleeping environment for a new baby. The compact size of a bassinet can be particularly useful if space in your home is limited or if you wish your newborn to sleep in your bedroom for the first few months. But buying a bassinet can seem expensive, particularly since it will only be used for short time. A more cost-effective and convenient solution is to hire a bassinet for the first few months of your baby’s life. 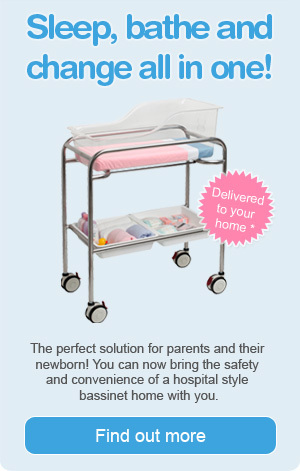 Hospital Bassinet Hire specialise in the short-term rental of multi-functional bassinets. Used in many Australian maternity units these bassinets provide new parents with an easily manoeuvrable first bed for their newborn, which can also be used as a bath and change table. Hiring a hospital-style bassinet offers several advantages to expecting parents. The multi-functional nature of the units saves the need to buy lots of separate pieces of equipment. While a conventional style bassinet offers just a sleeping area, hospital-style bassinets provide a safe and cosy bed for newborns, double as a bath and can also be used as a changing table. A handy storage area for all baby’s essentials sits within the bassinet frame. Hospital-style bassinets are also extremely mobile. Thanks to a sturdy, stainless-steel frame and large, lockable wheels the unit can be easily moved between rooms, including the bathroom, and is perfect for downstairs use in a two-storey home. The height of the unit and its easy mobility is especially appreciated by mums who’ve undergone a caesarean. And with a hospital-style bassinet you can keep an easy eye on your new baby, through the clear sides of the sleeping capsule. This is particularly useful at night when you can watch your newborn without having to get out of bed and also great for older siblings who can view their new brother or sister from a safe distance. Hospital Bassinet Hire’s professional service is designed to make life as easy as possible for expecting parents. The company will ensure delivery of your bassinet before you return home from hospital and collect it when no longer required. Your bassinet comes complete with a hygienic waterproof mattress and is thoroughly inspected, clean and sanitised before each new hire. Once in your home it’s easy to keep clean and changing of linen is a breeze. When your baby is ready to transition to a cot (usually between two to four months) Hospital Bassinet Hire will arrange to pick up the unit. No need to find storage space in your home for an item that is no longer needed. Hospital Bassinet Hire also supplies gift vouchers, which can make a unique and thoughtful gift for expecting parents.